Urban-Pro Guitar 2, Virtual electric guitar from Tru Urban. 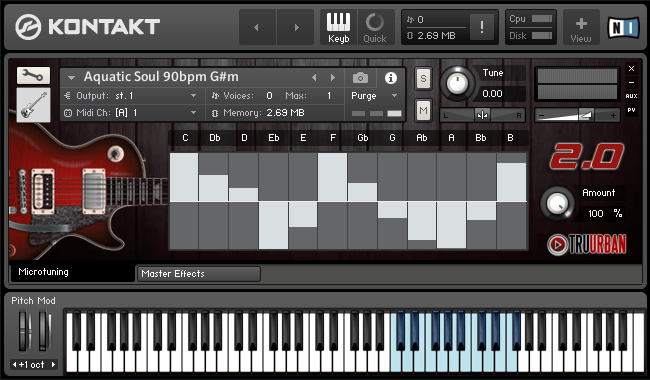 Tru-Urban releases version 2 of its Urban-Pro Guitar electric guitar licks soundbank. This new version features new guitar loops and phrases, new master effects, slices and a new tempo-sync mode. Urban-Pro Guitar 2 includes nearly 50 phrases played by a professional guitarist (in tempos ranging from 69 to 120bpm), perfectly sliced up and ready to throw into your next project. 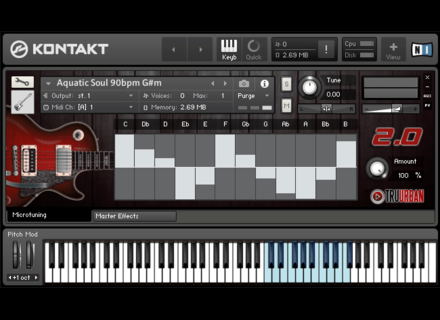 The Kontakt 5 interface features settings for delay, pan, distortio, eq, pitch and microtuning, saturation and others. Tru-Urban Pro Guitar 2 is available for $59. For more details, see truurban.com.